. . . our message must be to the world for them to listen, realize, become educated. As has been said here before, the world is getting smaller. I hope that one day history in the future will show who the true primitives are.
. . . The Hanford Site, as you see it, is a 569 square mile area chosen by the Federal Government for the Manhattan Project, because at that time they knew that they would need a tremendous amount of water. . . . This 569 square mile area now contains 570 million Curies of radioactivity . . . there is 200 square miles of ground-water contamination. There are 149 single-shell tanks which used to house the waste material. 66 of those 149 are known to leak and are contributing to the contamination of the environment.
. . . The technology to administer to nuclear waste is not here. Perhaps it is in the minds of the younger generations. Perhaps they can help us, but at the same time as I get old, as we all must do and pass on, I hope to leave in my chair a person that not only understands the culture, the language, the history of my people, but they must also realize the other road of modern science and technology. I do not believe it is impossible or difficult to achieve. No different, and two decades back that was the norm in education. But education has become somewhat by the wayside on a world-wide basis. For instance, when I was enquiring about a proposed repository in Hanford in 1978, my persistence finally caused them to ask me: "What the hell business is this of yours?" And I said: "You are on the ceded land of the Yakima Indian Nation, due to the treaty of 1855." And they said: "Treaty? What treaty? What the hell you talking about?" What it only told me, that each scientist, engineer, manager and whom ever, plain worker down there was not taught in the education curriculums and the institutions across this country about what a "treaty", "ceded land", "sovereign nation", "tribal government" meant. And they assumed that didn't exist because they were not taught in the schools. I would recommend that the curriculums change and put into print the true history of the indigenous peoples. Analogous to the time when some of you didn't even know where Tahiti was. Our children do not know world-wide geography, like we used to have to learn when we were young. I will continue to work with you and with anyone to preserve and protect my culture. It seems that the true E.T. is Edward Teller. . . . But in regard to all of this culture on a world-wide basis, I think it was best said by, or at least one of the great sayings was by an author, Peter Farb, who wrote the book "Men's Rise to Civilization". In there, and I quote: "Man is quick to prevent cruelty to animals, sometimes to humans, but there is no counterpart to the Humane Society or the Sierra Club for the prevention of cruelty to entire cultures." 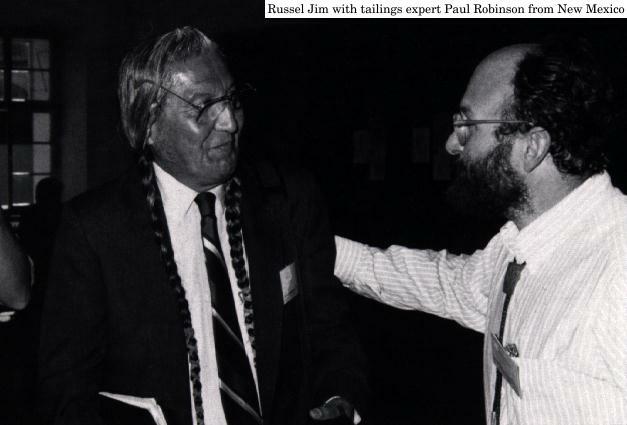 Russel Jim, Yakima Nation, Washington State, USA. Manager of the Environmental Restoration Waste Management Project. Thank you, Madam Chairman. Ladies and Gentlemen! I'm going to speak to you in English, a borrowed language to me and my people, but one that has now become universal for communication purposes. My name is Russel Jim. I am a member of the Yakima Indian Nation in the state of Washington in the United States what is in the Northwest region. I appreciate this opportunity to come to this old country, as they call it, and to bring a vital message along with the other messages that are so vital to humanity from the indigenous peoples of the world. I am most fortunate to have the ability provided to bring my wife with me. She is my support, just as the women being the stronger of the gender, our support for people world-wide. I have brought a few slides to show you the geographical location of not only the state of Washington, but the remaining reservation of the Yakima people. The messages we have heard here today are not only disturbing, but they are all similar. They are similar in the content that there is continued cultural deprivation and environmental deprivation, and the one thing we seemingly have the most in common in regard to trying to exist in a contemporary society is the average of 70 percent unemployment. So, my brief conclusion is what we suspect that all of this on a world-wide basis is by design. And as each of us are guilty of this attractive social high possesses called paternalism, it has come more so from those that feel that they know what is best for us, regardless whether they are a member of a church or a scientific group or a government. And it is quite disturbing to listen to these concerns that are analogous to the Yakima Nation who have also suffered deeply. Not from mining of uranium, but of the finished product. The Manhattan Project and its early start eventually had to have a place for its refinement. And after much searching and deliberations they'd chose the land of the Yakima. And in this Day of the Water, the land of the Yakima include the economical lifeline of the Northwest region of the state of Washington, and that is the mighty Columbia River where millions and millions of fish used to migrate and which is the primary diet of the Yakima people as it has been for thousands and thousands of generations. We are very indebted to those that are responsible for us to come here to this great city and to air our grievances and to educate others about what is happening in other parts of the world. We are indebted to science and to the scientists like Dr. Alice Stewart who I think should be one to help us provide quality assurance and quality control among scientific research and development. We will be forever indebted to Vladimir Chernousenko, a physicist who gave his life to go to Chernobyl and then to come here and report on it. It is no sadder than the people that have been annihilated to one form or another on a worldwide basis, no sadder than those that have stated and given names on this death. And so, we also come with a message, but I hope this form in the realization that our message must be to the world for them to listen, realize, become educated. As has been said here before, the world is getting smaller. I hope that one day history in the future will show who the true primitives are. Now, if I may have those slides. This that you see is the state of Washington. The outline, the large outline is the ceded area, 12 million acres, that in 1855 the Yakima Indian Nation ceded to the United States government in a treaty. But it was the understanding that forever we would be allowed to utilize the ceded land to gather our foods and our medicines, to pasture our animals, and to hunt and fish in all usual and accustomed places. The Hanford Site, as you see it, is a 569 square mile area chosen by the Federal Government for the Manhattan Project, because at that time they knew that they would need a tremendous amount of water. There was cheap hydro-electricity there and it seemed ideal to them in more ways than one, because they said also, it is a waste land and a minimal amount of population, and those people were expendable. This "waste land" has provided foods and medicines for the Yakima people for generations, as I have said. This 569 square mile area now contains 570 million Curies of radioactivity. It contains among many unknown trenches, ponds, ditches, where in the fifties the state of the art was to just dump the waste into the land and hope it filtered through the land and get back into the water -- which it is now, but it is creating tremendous amounts of contamination. It has been publicly noted there is 200 square miles of ground-water contamination. There are 149 single-shell tanks which used to house the waste material. 66 of those 149 are known to leak and are contributing to the contamination of the environment. There are 28 doubleshell tanks to which the lickers were eventually moved; one want to know as how high is(?) the potential to explode and they have yet to characterize what is in this tank. There are improper records kept on just about every facet of this area and this place and of the amounts of material that has gone into the ground, into the water. As you will see, over a quarter of our ceded area encompasses the state of Washington. We figured that we had paid our taxes for all time when we ceded this land, 10.8 million acres. But some of you may have read that last year, the Supreme Court ruled an immoral decision that we must pay further taxes. So it's a continuation of the erosion of rights. And analogous to what has been said here in regard to the deprivation of our culture for our future generations it was best, it was somewhat said by Noam Chomsky when he said very simply: "Dead men tell no tales." When you are forced with another language and your culture is gone, you are then subjected to a different value system about your land, your language, the foods, medicines. This slide was made because of when Mount St. Helens blew, it went to the Northeast, part of it through our reservation, travelled around the world twice and they seemed to imply that the Hanford Reservation air always goes to the North and the East and the Southeast. But this shows that the second and third eruption of mount St. Helens went to Portland and Seattle. These are the seven tribes located close to the Hanford Site. -- The confluence of these three rivers, the Yakima, the Snake and the Columbia, bear witness to the fact of this as a very low region. This was the wintering ground of the Yakima Nation people for thousands and thousands of years. From here we would migrate on a temporary basis to Canada, to the coast, to western Montana, northern California, northern Arizona. Knowing at all times where the foods and medicines were and gathered them respectively. This is another showing of the area and the relationship of the Yakima Reservation to the Hanford Reservation. [This was] one of the main reasons that the forefathers, our forefathers and signators to the treaty, made the provision that we would forever be able to gather our foods and medicines on the ceded land: They knew that you take 14 tribes and bands and put them on a little piece of real estate, that land is going to become too small one day. Which it is. And the environmental degradation is continuing. Which makes it all the more important that Hanford be cleaned up in a manner in which it will be safe for our people to gather foods and medicines again. This is very hard to see, I realize. But these are the releases of the radionuclides into the air in the 1940's and fifties and sixties. You will see that in 1945, they released 340,000 Curies of iodine-131 into the air, that was only in one year period. The next year, they released 79,000 Curies. And as Tom Bailie mentioned to you, in 1949, they intentionally released 7,800 Curies as an experiment on the land and the people. There are nine monolith-like destructors in this picture. Nine reactors out there along that Columbia River system. Most of them within 300 yards of the mighty river. Most of what's dumped much material into that whole system. There is yet a decision to be made whether or not to dismantle these monoliths and bury the core reactor somewhere or maybe leave them standing. If they do leave them standing it will be witness to the Faustian bargain that science has made with society. This is Gable Mountain, a sacred mountain to us, but I heard once it had been used by the Department of Energy to drill into so they can study the basalt formations. If there is any success story, it was for us to fill up these tunnels you will see in the next slide. They had miles of tunnels in this mountain. -- And they, by a fluke in a reclamation agreement, they filled these tunnels back up and restored this mountain back as near as possible. That is another story and leads me to regret that I only have 20 minutes to speak to you. Lights, please. The Yakima Nation would like to continue to work with the United States Department of Energy, the Nuclear Regulatory Commission, Environmental Protection Agency, Indians, all people, so that one day we can clean up the site. There has been questions, not only in this place, but in the United States and wherever, seemingly implying that the Yakima Nation has agreed to bring and store waste on our reservation. That is untrue. What we want is the study of any and all technologies, because it is yet undetermined what is to become of the 64 million gallons of waste that is in those tanks. What is to become of the billions of cubic yards and billions of gallons of material that must be tended to? As the Assistant Secretary of Energy said: "We must work together on research and development, because the technical tooth fairy has not shown up." The technology to administer to nuclear waste is not here. Perhaps it is in the minds of the younger generations. Perhaps they can help us, but at the same time as I get old, as we all must do and pass on, I hope to leave in my chair a person that not only understands the culture, the language, the history of my people, but they must also realize the other road of modern science and technology. I do not believe it is impossible or difficult to achieve. No different, and two decades back that was the norm in education. But education has become somewhat by the wayside on a world-wide basis. For instance, when I was enquiring about a proposed repository in Hanford in 1978, my persistence finally caused them to ask me: "What the hell business is this of yours?" And I said: "You are on the ceded land of the Yakima Indian Nation, due to the treaty of 1855." And they said: "Treaty? What treaty? What the hell you talking about?" What it only told me, that each scientist, engineer, manager and whom ever, plain worker down there was not taught in the education curriculums and the institutions across this country about what a "treaty", "ceded land", "sovereign nation", "tribal government" meant. And they assumed that didn't exist because they were not taught in the schools. I would recommend that the curriculums change and put into print the true history of the indigenous peoples. Analogous to the time when some of you didn't even know where Tahiti was. Our children do not know world-wide geography, like we used to have to learn when we were young. Ladies and gentlemen, the health and welfare of my people is paramount in my work. I maintain the stance that I'm neither pro-nuclear nor antinuclear, but pro-safety for all people. I have my reasons. In this manner I do not get doors slammed in my face. And so I hope that I can promote this understanding on a world-wide basis. On the positive side, if there is any, the U.S. Department of Energy has recognized the necessity to involve tribes into the clean-up process now. Hanford used to be the production place for plutonium. There was where we made the second bomb that was dropped. But one of my Elders who was in World War II adequately said, or appropriately said: "What we are dealing with at Hanford now is Tojo's revenge." We have the most waste by pure volume, tremendous amounts of environmental degradation. Continuously those that seem to want to maintain conservancy say: "It can't be cleaned up in order for you to gather your foods and medicines, that would cost too much." My reply is that we can all agree that to clean it up completely is the best for the future generations. And that should be the impetus for Congress to provide the funding and continuously to clean this place up and other facilities. There are other, the other 124 facilities like Hanford in the United States and Puerto Rico. But Hanford is the worst, admittedly by the United States government and by everybody. I will continue to work with you and with anyone to preserve and protect my culture. It seems that the true E.T. is Edward Teller. And as we go through these quotations that I'm going to say to you, these philosophies, which most of it is borrowed today anyway, I would like you to consider them in the context and the heart moods they are given. Bion, a Greek environmentalist in 600 B.C., said: "Although the boys may throw stones at the frogs in sport, the frogs do not die in sport, they die in earnest." That is an analogous to what has happened here by humankind on the environment. And in this attempt to preserve and protect my culture, to be able to be allowed to speak my language, to teach my son the language and songs that are so beautiful and so important. If I stutter a bit it is because this English language is not adequate to say to you what I would like to say. I could say it in my own language, but then you wouldn't know what I'm saying. But in regard to all of this culture on a world-wide basis, I think it was best said by, or at least one of the great sayings was by an author, Peter Farb, who wrote the book "Men's Rise to Civilization". In there, and I quote: "Man is quick to prevent cruelty to animals, sometimes to humans, but there is no counterpart to the Humane Society or the Sierra Club for the prevention of cruelty to entire cultures." I thank you for your time and I again applaud Claus Biegert, Tom LaBlanc, Guenter Wippel, all of those, all of you that saw this to make possible this gathering. For me, to make new friends and visit what's old. And I hope that we all come to an agreement to say to the world: Not only is uranium harmful in this present status of digging it up, but also any degradation with environment is not just romanticized by saying: This is our Mother Earth, you harm Mother Earth, you harm yourself. That's not romanticism, it is true fact. And I hope throughout this whole effort will come continued committees and gatherings so that our future generations will not look back upon a legacy of wondering, what did our ancestors do about this situation?